Now that I’ve finally figured out how to make them, I can’t get enough of tamales. And neither should you. After a Zipcar expedition to Linden, New Jersey for sliders at White Rose System, I happened to drive back through the Mexican neighborhood in Port Richmond, Staten Island. The main drag is lined with Mexican groceries, and I thought (correctly, as it turned out) that they might be superior to what’s available in Manhattan. At the first place, they were totally confused when I asked for lard, and I couldn’t remember the Spanish word (pork fat! you know, the kind you use to make tamales! ), but at the second place, my memory revived – it’s manteca. The guy was delighted that we were making tamales and insisted that we buy Oaxacan string cheese for a Oaxacan version. The next time we came, he promised, he’d give us directions for sweet dessert tamales. 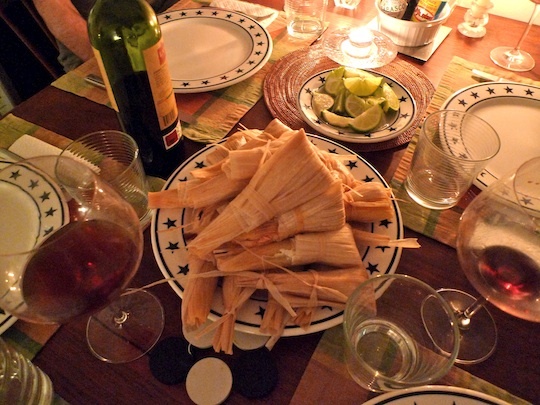 In the event, I ended up preparing Diana Kennedy‘s chicken tamales for a second time (link at the top of this post), as well Oaxacan cheese ones (main contents: Oaxacan cheese and jalapenos) and a marinated skirt steak tamale recipe that I found online. Unfortunately I can’t find the recipe any longer – post yours. Serve with limes and copious quantities of different kinds of El Yucateco hot sauce. P.S. I need to do this with fresh masa sometime… available from Tortilleria Nixtamal in Corona. See this excellent article on where to buy Mexican ingredients in NYC (Port Richmond, sadly, is overlooked). Yum Yum. Tamales, a Xmas tradition but good all the time.